Last week Friday I had the opportunity to observe and explore kindergarten two classrooms at a school that specialises in teaching the first two years of school. Looking around the second classroom I visited, I was reminded of what I would like to create my own room. The building corner made me realise that I wish to bring more natural materials into my space and stop using the plastic bins that are frequently used by teachers. As I walked around the room, there were smalll things that caught my eye which created a relaxing and harmonious space for the children. What I noticed was the focus on natural baskets and neutral colours. Below are a few ideas that I wish to put into place – especially for next year. I am thinking of changing a little the way in which I display the children’s work in the classroom. I liked the board I saw in the front of the room next to the carpet. Children’s self-portraits were displayed as well as their current drawings and art work. I currently have many ideas buzzing in my head at the moment – and many thoughts on games to create for the children. This will be done bit by bit, year by year. As the hosting teacher told us, it took her many years to get her room looking the way it does with all the wonderful activities in it that she had created. This week I am grateful to have had the opportunity to visit a FDK classroom. The experience was inspiring and energising. Wonderful! I love using materials inspired from nature. Was this a Montessori school? No, a public school. But the teacher had been Montessori trained and she applied plenty of her knowledge in her classroom. That is great that she was able to do that! I did 6 months of training at a Montessori school, when I was getting my teaching degree. I love their philosophy. I do t k ow much about their philosophy – but what I do know, I like. Colline, it looks like you have a lot of work before you, but it will be both fun and rewarding. And a for a season I went all natural – even the ” paper in” box on my desk was a wicker weave. So for me – I find that sometimes change is good. I find that sometimes the all natural feel to baskets might be appealing because it is so different and maybe even softer/ however – going back to plastics and vibrant color felt good after that because it was lively – if that makes sense. And then sometimes color coding stations was awesome – a an all green literature nook – with a theme – and then a puzzle station set up with blue! And maybe the science could have the natural weaves and baskets or jus have natural baskets for certain learning items like seashells. Oh and I once heard someone say she did not use baskets because of germs and she felt it was cleaner to have tubs that get washed and dried – but this was also for messy art class where more washing is needed! Quick auestion – who watches your class when you go and visit like this? I like the natural colours as it does have a calming effect on the children. Too much colour and too many things on the wall does excite them on a subconscious level. I have white plastic bins at the moment for some of the things I have. But as I am still building my room, I can go either way. The school board I work for has in place a good substitute teacher program – so any time I am off sick or attending a workshop during work time, I can book a substitute teacher to come into my room and follow the plans I leave on my desk. I try to use the substitute teachers that the children know so that it is not too stressful for my kids. 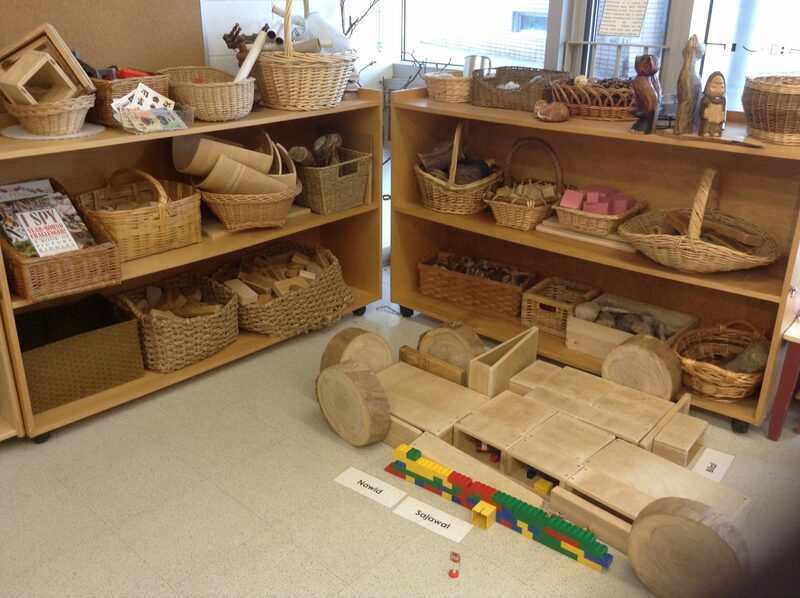 Those natural materials and neutral colours create a wonderful invitation to children to create, imagine and play. I agree Norah. And I am looking forward to the change in the environment. I will keep you informed on the progress. This looks like a lot of fun. I believe the children will benefit a lot from such learning especially arty stuff to do with their fingers. Hands-on is always the best way for children to learn – no matter what their age is.